I’ve always thought that chevron stitch is like the Cinderella of the bead-weaving world: you might not think that it looks like much at first glance, but once you see just how many things you can do with this off-loom bead-weaving stitch, you’ll find yourself using it for everything! Chevron stitch, sometimes also called chevron chain, can be stitched flat, round, or tubular to create beaded necklaces, bracelets, and earrings. But the unique thread path of chevron stitch can also be used to create items like beaded vases and vessels, and other sculptural objects. This stitch can be used to create beaded bezels for your favorite cabochons and stones, or it can be stitched flat in a single row and embellished with your favorite pearls, crystals, or glass beads. Chevron stitch beading is quickly becoming a favorite off-loom, bead-weaving stitch among those who love right-angle weave and netting. This easy-to-learn beading stitch can be used to create a whole range of beaded objects including home décor, sculptural objects and vessels, and of course, beaded jewelry. Beaded chevron chain can be stitched using a variety of beads: seed beads, small round glass beads, pearls, and crystals all lend themselves to this traditional off-loom bead-weaving stitch. If you like to experiment and bead with different shapes and sizes of beads, this stitch is a wonderful “playground” for your imagination, too. 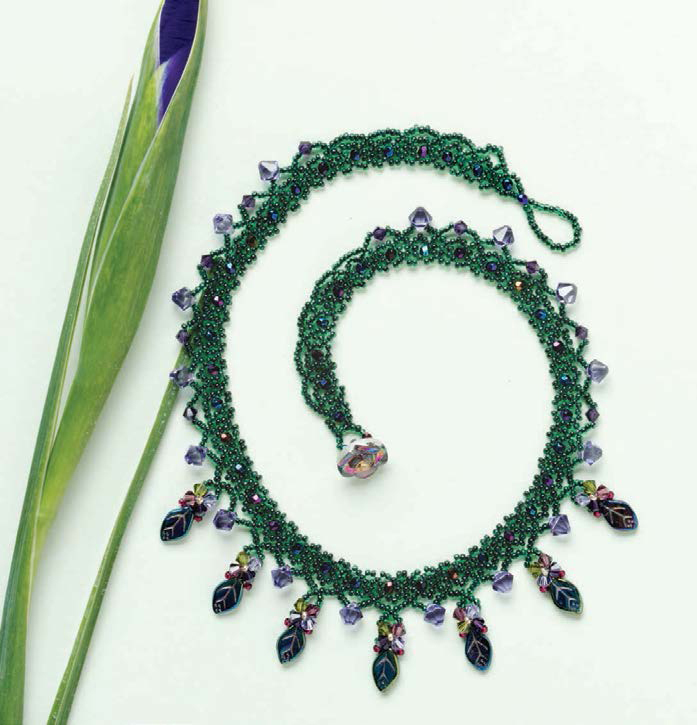 You can work up this stitch using beads like round glass druks, Czech fire polished beads, crystal bicones, or even two-hole seed beads and pressed glass beads. Pearls are an especially elegant addition to any chevron stitch design, whether you make a beaded rope out of tubular chevron stitch, a gently curved base for a necklace, or a dazzling component for a beaded bracelet or pair of earrings. The open-work look of chevron chain also creates a wonderful base for adding fringe and other beaded embellishments. 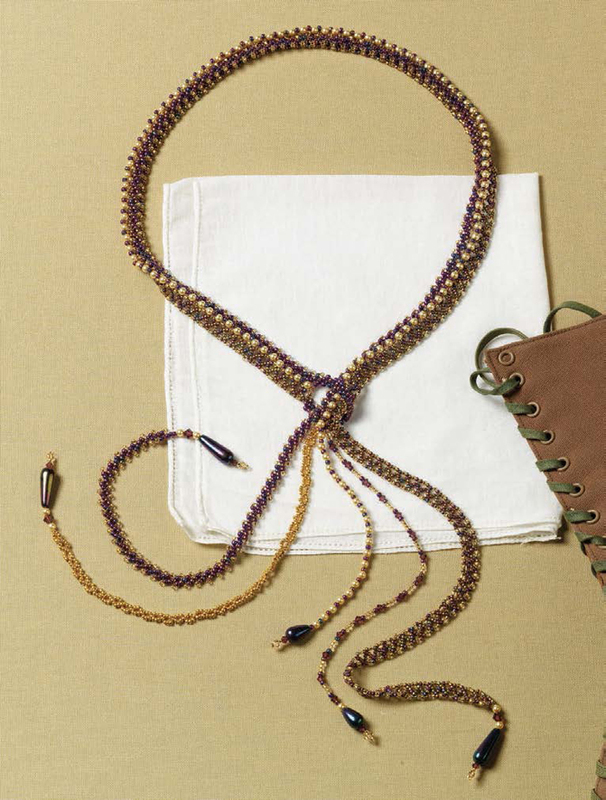 With its origins in traditional African beadwork techniques, this stitch has been adapted for modern jewelry-making projects throughout the world. Whether you stitch it flat like a chain, tubular for a rope, or circular for a bezel, you’ll find that chevron stitch beading opens up a whole world of possibilities for creating your own beaded jewelry designs. 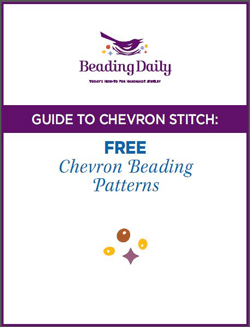 Download your copy of our FREE eBook, Guide to Chevron Stitch: Free Chevron Beading Patterns, today! 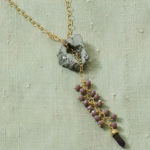 This beautiful chevron stitch necklace uses a flat chain for the base, creating a lacy, Victorian look by including metallic beads, pearls, and crystals. A little bit of beaded embellishment on top and bottom and a spectacular brass filigree pendant with an embellished pearl combine for a classic chevron stitch necklace that you can wear anywhere. Coming from a master bead artist who has chosen chevron chain as her preferred beading stitch, these graceful beaded earrings use circular chevron chain to form a bezel that holds a crystal chaton. These beaded earring components also work well when used to embellish beaded bracelets, collars, or use them as components to embellish bead embroidery! This playful beaded chevron stitch pattern is embellished with netted fringe, crystals, and pressed glass leaves. 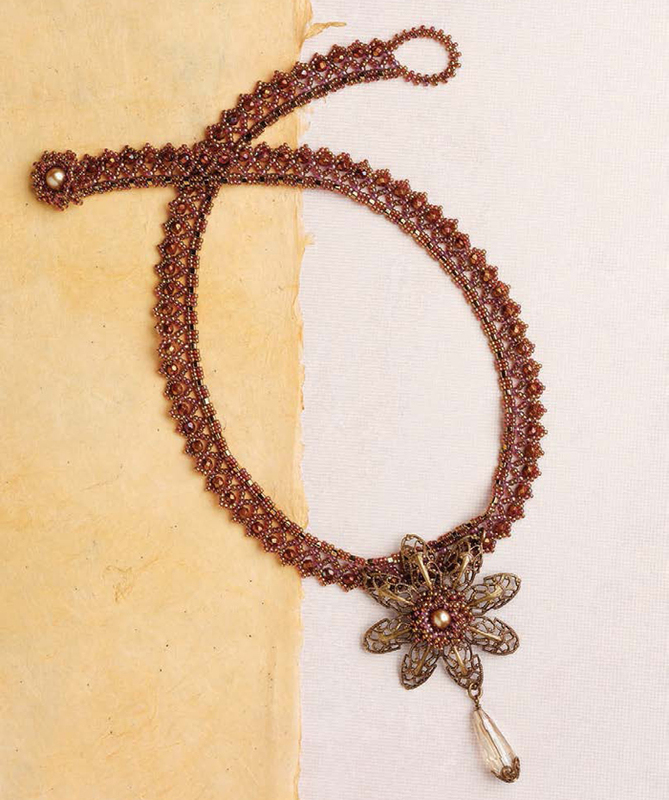 A simple button-and-loop closure holds this beaded necklace securely. A fun exercise in combining chevron stitch with right-angle weave, there are many ways you can customize this chevron stitch beading project using your favorite beads—or just the beads you happen to have in your stash right now. Chevron chain, St. Petersburg chain, fringe, and peyote stitch get thee royal treatment in this creative beaded lariat project. Seed beads, glass beads, pearls, and crystal bicones are all used in this chevron stitch pattern that’s fit for a queen and will make you feel like a princess. The beaded fringe adds the perfect finishing touch to this variation on the classic beaded necklace that you can dress up or dress down for any occasion. Working up to create these 4 FREE chevron stitch beading patterns will give you experience in working with several different variations of chevron stitch. Learn how to create a flat chevron chain necklace, embellish a flat necklace with fringe and other beaded embellishments, how to work circular chevron stitch for use as a bezel, and how to create chevron stitch using beads like pearls and crystals. This stitch is also a great beading stitch to build on when you combine it with other bead-weaving stitches like peyote stitch, right-angle weave, or beaded netting. 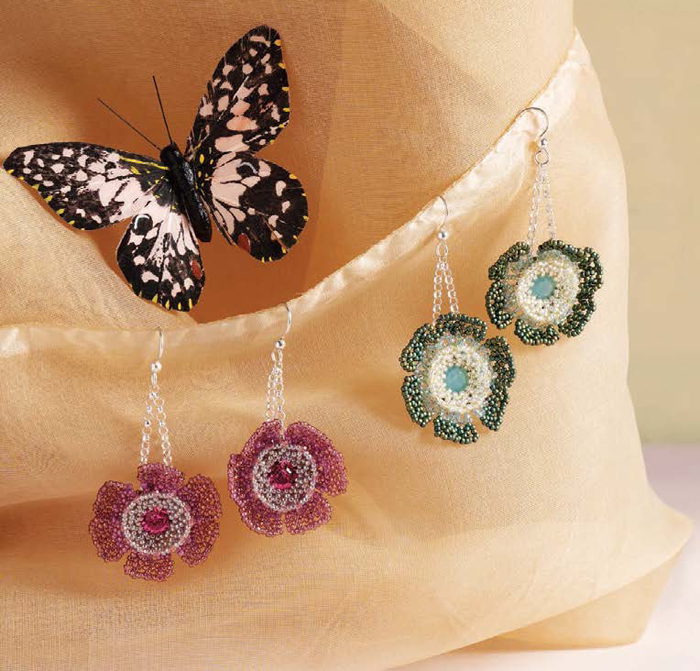 Ready to discover how you can use this stitch to create fantastic beaded jewelry designs? Start stitching with chevron stitch with these four free chevron beading patterns, and discover for yourself why beaders love chevron chain!